Watch Your B’s and Q’s! A devastating tropical and subtropical pest—already considered a top invasive species—just got a bit more troublesome. 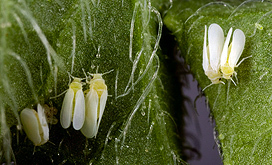 Bemisia tabaci is the scientific name for a collection of closely related whiteflies that are worldwide agricultural pests. There are more than 20 known biotypes of this species, with two of the most devastating to plants being the B and Q biotypes. Both can reduce yields of a broad range of agricultural crops. The B biotype was first discovered in the United States in 1985, as a result of movement out of its native range of the Middle East/Asia Minor area. This aggressive biotype threatened agricultural production throughout the southern United States until new integrated pest management strategies brought it into check. For years, researchers in ARS’s Subtropical Insects Research Unit at Fort Pierce, Florida—including entomologist Cindy McKenzie and molecular biologists Bob Shatters and Laura Boykin—have studied the B biotype of B. tabaci. Now, however, a disturbing new whitefly discovery has their attention. First detected in the United States on poinsettias from an Arizona retail outlet in December 2004, biotype Q has been identified in 25 states. Its native range is the Mediterranean Basin, and as with the B biotype, human transport of infected host plants is suspected in the introduction of these pests well beyond their home ranges. 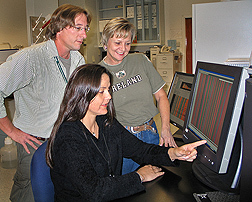 Molecular biologist Bob Shatters (left), entomologist Cindy McKenzie, and postdoctoral scientist Laura Boykin (foreground) study genetic polymorphisms in the whitefly (Bemisia tabaci) that are used to study the relationships among the B and Q biotypes. Associating these genetic markers with population traits provides a rapid means of tracking the movement of whitefly types. In comparison to the B biotype, the Q biotype is less susceptible to many pesticide types, leaving fewer chemical options for control. There is also increased concern that insecticide resistance may develop more rapidly with Q. Making things more difficult, the Q biotype is indistinguishable in appearance from the B biotype. “This was not welcome news when we first heard about it,” says McKenzie. “But we’ve taken several steps to ensure that we’ll be able to accurately distinguish between the two whitefly biotypes.” As part of a nationwide task force studying movement of the Q biotype and related whitefly control issues, the ARS scientists have analyzed more than 3,000 individual whiteflies. The task force is composed of scientists from government agencies, universities, and private industry brought together to provide leadership in dealing with this new invasion. Through the task force, samples of B. tabaci were sent to the ARS scientists by ornamental growers from sites throughout the United States. The researchers use DNA segments that provide unique signatures to distinguish between biotypes B and Q. When the Q biotype appeared in the United States, there was great concern that it may cross with the already well-established B biotype, producing an even more problematic pest. The genetic-marker work by the ARS scientists showed that there wasn’t a single hybridization event observed between the two biotypes. Therefore, a “superbug” hybrid is unlikely to develop. The task force, with the help of the ARS scientists, has developed new treatment recommendations—such as watching your neighbor’s fields and getting your whiteflies biotyped—to deal with the Q biotype. Rapid implementation of these strategies has greatly reduced control problems and has helped to slow or prevent the Q biotype’s movement into fields of vegetables. Knowledge of its whereabouts will aid more effective action to curb its spread and prevent serious economic losses, especially to the ornamentals industry. Details of this research have recently been published in the journal Molecular Phylogenetics and Evolution. More information on biotyping whiteflies and sound management guidelines can be found at www.mrec.ifas.ufl.edu/LSO/bemisia/bemisia.htm.—By Alfredo Flores, Agricultural Research Service Information Staff. Robert G. Shatters, Cindy L. McKenzie, and Laura M. Boykin are in the USDA-ARS Subtropical Insects Research Unit, 2001 South Rock Rd., Fort Pierce, FL 34945; phone (772) 462-5800, fax (772) 462-5986. "Watch Your B’s and Q’s! A New Whitefly's on the Move" was published in the July 2008 issue of Agricultural Research magazine.